Labor Day, 2018 marks ten years since the reopening of the renovated Upper Noe Recreation Center. Five years ago, we celebrated the smashing success of our little park and community center. In preparation to do it again, Friends is working with Rec & Park to repair our exterior play areas to have them match the excellent condition of the building and playground. The tennis court, blacktop court and dog run all need resurfacing. Joby’s Run dog play area is most critical. The decomposed granite has worn away completely in spots. The blacktop basketball court can be saved with a topcoat of a few inches of asphalt if it is done soon before the structure deteriorates. The same is true with the tennis courts; Rec & Park is in process of resurfacing tennis courts countywide, ours just keeps being put on the wait-list. Steady maintenance rather than deterioration and renovation is the goal. Please let Rec & Park know how you feel by calling 311 or going to sf311.org today and requesting service on our park’s surfaces. Upper Noe Neighbors celebrates 30 years of community service on Wednesday, March 21 at 7 p.m. in the auditorium. Mark Leno, on behalf of Scott Wiener, will present a commendation from the California State Senate. At 7:30 District 8 Supervisor Jeff Sheehy and challenger Rafael Mandelman face off in an informational forum. As they head toward the June election, they eagerly share their views on the state of San Francisco and their proposals for tackling our most pressing issues. Where does all that sand go? Everywhere. And lately the box looked extremely low. Parents have been registering complaints that it was becoming too deep and difficult to use. Everyone was concerned about the exposed interior concrete ledge. This month Friends of the Noe Valley Recreation Center stepped up with over $1000 to fill it up again. 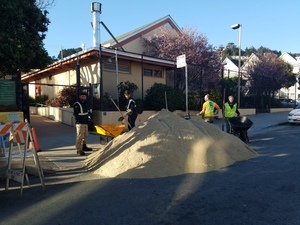 Eleven tons of fresh, washed and screened sand was delivered promptly. Thanks go out to Rec & Park gardeners for moving it all by hand. Parents, note that the cover over the sandbox is there to keep animals out to ensure the sand stays clean. Please help by remembering to cover it in the late afternoons if the sand is exposed. This is especially important on Sundays and Mondays when the park personnel are not on duty. 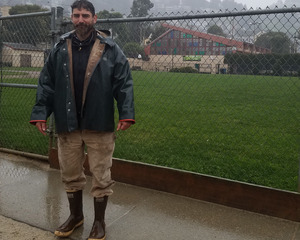 If you have noticed how nicely groomed the grounds of Upper Noe have been, please don’t hesitate to say “Thanks” to our Rec & Park gardeners, especially to our site gardener, Ryan. He clearly loves his work. Notice the lovely natural wood and stone borders added to the gardens, the lack of weeds and the regular addition of fresh mulch. Strong initiative and a keen eye for detail makes it all seem effortless. Trimming takes place so timely that service requests have diminished. There does not seem to be a corner of the park that is not receiving excellent care. volunteer groups, such as our own Ladybug Gardeners, and stresses the need to coordinate efforts. He relies on park users to keep him informed. However, he prefers that folks not make requests directly to gardeners on the job. They need to stay on task. Calling 311 is absolutely to best way to get action, says Frankie. “I look at that” and it keeps requests organized. Spring is finally here again. 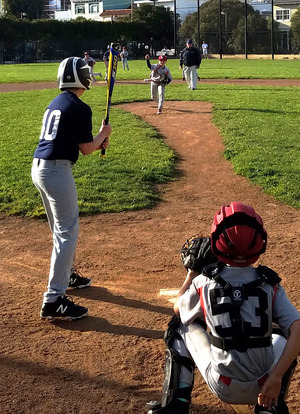 Kids 12 and under are eagerly making great use of Upper Noe’s non-regulation ball field. These CYO leagues drew a large crowd. Games from a variety of leagues and ages are common weekday evenings and weekends. Stop by and cheer them on. San Francisco Police Department recommends SAFE-Bikes to help citizens recover stolen bicycles. Go to sfsafe.org/safe-bikes/ and register your bikes today. Take a brief survey http://sfrecpark.org/survey/ to help Rec & Park better serve the community. Participants can enter to win a $50 gift card. 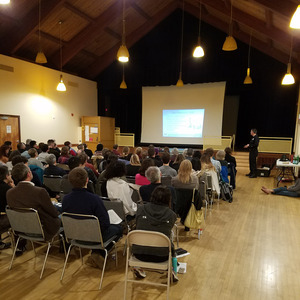 The SF Fire Department’s Neighborhood Emergency Response Team (NERT) training sessions at Upper Noe were a huge success. The six-week course filled all 85 spots quickly. Dozens of others on stand-by missed out. Another session for Upper Noe is in the works. Stay tuned. Learn more about NERT at http://sf-fire.org/neighborhood-emergency-response-team-nert . Gardeners have inspected the irrigation system that keeps our little dog run sanitary and reduces the amount of dust. That’s a critical step in preparing for drier weather ahead. The decomposed granite surface depends upon regular sprinkling to keep it conditioned. Please be patient if gardeners need to closes the run briefly now and then as they do their work. info@noevalleyreccenter.com with any questions or suggestions. Share this newsletter to your friends and neighbors. Please help us to promote Upper Noe Recreation Center as your neighborhood center and to connect with all members of the community.